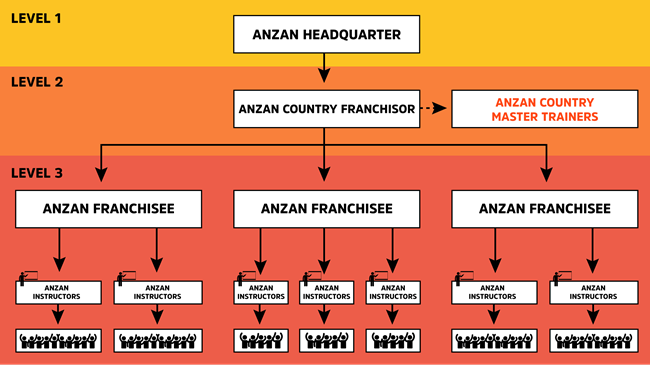 HOW ANZAN FRANCHISE SYSTEM WORKS? The system basically works at three levels. Level 2 -ANZAN COUNTRY MASTER FRANCHISORS are under ANZAN HEADQUARTER. and ANZAN STUDENTS under FRANCHISEES. LEVEL – 1: WHAT DOES ANZAN HEADQUARTER DO? ANZAN HEADQUARTER is the top organization in all ANZAN system in the world. It cooridanates the system, sets up training programs and training materials. 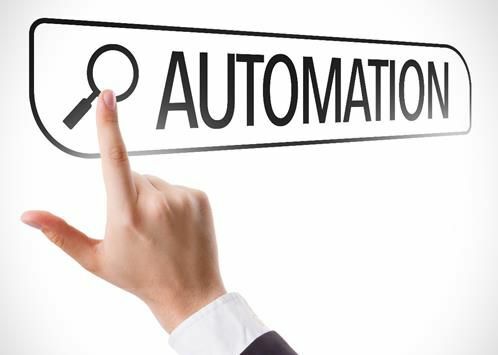 It manages all online management systems and the entire online training system. It also trains and certifies ANZAN COUNTRY MASTER TRAINERS. LEVEL – 2: WHAT DOES ANZAN COUNTRY MASTER FRANCHISOR DO? ANZAN COUNTRY MASTER FRANCHISOR is the top organization in a country. ANZAN COUNTRY MASTER FRANCHISOR evaluates prospective ANZAN FRANCHISEE applications, sells rights to be an ANZAN FRANCHISEE to a certain region, town, city, a part of a city etc. in that country. It also manages all ANZAN FRACHISEES’ operations through a centralized automation system via online panels provided by ANZAN HEADQUARTER. ANZAN COUNTRY MASTER FRANCHISORtrains and certifies ANZAN FRANCHISEE INSTRUCTORS, provides online passwords and training materials for each of the ANZAN FRANCHISEE students and organizes NATIONAL MEMORIAD™ ANZAN CHAMPOINSHIP every year in the country. LEVEL – 3: WHAT DOES ANZAN FRANCHISEE DO? ANZAN FRANCHISEE pays a franchise fee to ANZAN COUNTRY MASTER FRANCHISOR to be an ANZAN FRANCHISEE. ANZAN FRANCHISEE employs its own instructors and sends them to ANZAN COUNTRY MASTER FRANCHISOR to be trained and certified as ANZAN FRANCHISEE INTRUCTORS. A training fee is paid for this service to ANZAN COUNTRY MASTER FRANCHISOR. ANZAN FRANCHISEE trains children aged between 5 and 12 years old who were registered for ANZAN Training System in their own area through Certified ANZAN INTRUCTORS. ANZAN Training system takes place bothonline and offline exercises in the class. In addition to the guided training in class, students will perform daily online exercises at home. ANZAN FRANCHISEE opens online classrooms, assigns ANZAN INSTRUCTORS to the related classes, registers its students to online system and provides educational materials and online passwordsfor each student. WHAT DOES ANZAN INSTRUCTOR DO? ANZAN COUNTRY MASTER FRANCHISOR opens accounts and provides online password and username to allANZAN FRANCHISEE INSTRUCTUR. This online account allows instructors to manage and guide online courses in classroom and follow students’daily online exercises done after class. By using the online system, ANZAN INSTRUCTOR is able to print appropriate exercise materials at various settings. WHAT DOES ANZAN STUDENT DO? Students go to ANZAN FRANCHISEE center for training and trained under the guidence of ANZAN INSTRUCTOR for 3 hours per week. On the other days of the week,students do theirhomework exercises in Online Education Panel with the online password provided to him/her.It usually takes average 15-20 minutes every day. He/She also plays IQ Games under the guidance of ANZAN INSTRUCTOR during classroom as another part of training. 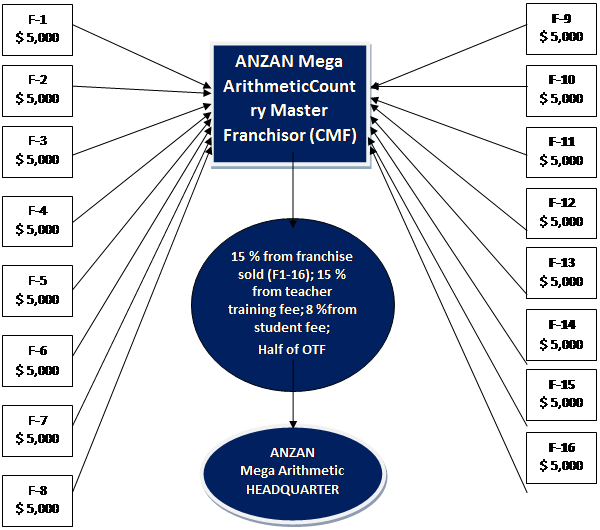 HOW TO BECOME AN "ANZAN COUNTRY MASTER FRANCHISOR"
Entrepreneurs who think that ANZAN FRANCHISE system is a promising business in any country apply to ANZAN HEADQUARTER. ANZAN HEADQUARTERevaluates the applications and negotiates with the candidates who are eligible according to the applicant's economic power and the potential to do business in that country. If the applicant is eligible for the system, the contract is signed by both parties. As a result of the contract, the entrepreneur candidate pays fee to ANZAN HEADQUARTERto be an exclusive COUNTRY MASTER FRANCHISOR. 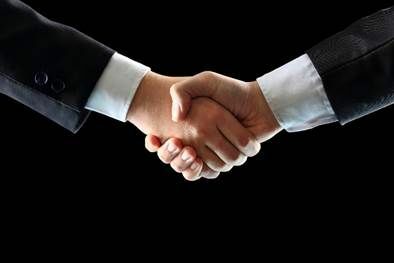 As a result of this agreement, COUNTRY MASTER FRANCHISOR has the rights to sell ANZAN FRANCHISE rights in his own country and the right to train INSTRUCTORS who will work under FRANCHISEES. However, he must have COUNTRY MASTER TRAINER for this purpose in order to provide these trainings. COUNTRY MASTER FRANCHISOR must have at least two COUNTRY MASTER TRAINER. COUNTRY MASTER FRANCHISORS’ MASTER TRAINER can only be trained and certifiied by ANZAN HEADQUARTER. COUNTRY MASTER FRANCHISORSwill pay training and certification fee to ANZAN HEADQUARTER for master trainer training. With this agreement, ANZAN COUNTRY MASTER FRANCHISORwill have rights to open one ANZAN FRANCHISEE as ANZAN CENTER FRANCHISEE in his/her country without paying any franchise fee. Thus, ANZAN COUNTRY MASTER FRANCHISOR is entitled to start student trainings in its own ANZAN center. Hereby, the ANZAN Training system starts in that country. HOW DOES THE ANZAN FRANCHISE SYSTEM WORK IN A COUNTRY? This section describes the monetary relationship or sharing amongANZAN HEADQUARTER, ANZAN COUNTRY MASTER FRANCHISOR and FRANCHISEE. Monetary values ​​described here are an example only. Monetary values ​​are determined by negotiating between ANZAN HEADQUARTER and ANZAN COUNTRY MASTER FRANCHISOR according to the economic conditions ​​of the country, the financial power of the families in that region, the per capita gross output of the country written in the contract. The flow chart of the ANZAN FRANCHISE system operation is given below. Family pays to Franchisee for student. Franchisee pay FF to CMF for 5 year franchise term. CMF shall pay 15 % of FF to Anzan Headquarter. Franchisee shall pay 16 % of SRF (or a fix value may be decided) to CMF as royalty fee. In return for 8 % of SRF, CMF gives training materials and online password per student. In return for 8 % of SRF, ANZAN HEADQUARTERprovides online password for student. All franchisees (F1-16) shall pay at least 16 % of the student registration fee from each student per year (for 2 Level Training) to CMF as a royalty fee. Teacher training shall be provided by Master Trainers of CMF. CMF Master Trainers shall be trained by ANZAN HEADQUARTER. All education materials, online passwords and certificates shall be provided by CMF. Certificates and online passwords are compulsory for each student and every levelthat are issued by ANZAN Headquarter. As long as instructors (including Master Trainers) are active in the online system10 US$/month online service fee (OTF) shall be paid by CMF to Anzan Headquarter. All payments are managed by ANZAN ONLINE SYSTEM. CMF should not make any financial calculation. Including managing a “National Anzan Championship” organization, everything is being taken care by ANZAN ONLINE SYSTEM. A hypothetical example is given below. For every operation, there is a monetary value. For each operation there is a monetary counterpart in the in the Anzan Online System. Because of this, all parties must have deposited some money into their account. Let’s suppose CMF sent 1500 USD to Anzan Headquarter. When Anzan Headquarterreceives this money, this amount is deposited to CMF account by Anzan Headquarter. Now, CMF has 1500 USD in his account. CMF can do any operation in the online system until all the money is finished in the account. Let’s suppose CMF sold a Franchisee right to Franchise-1. This means, he receives 5000 USD from the new Franchisee. New Franchisee must have an account in the Anzan online system in order to do his online operations such as registering a new student, buying a course for the student etc. When CMF opens an online account for the new Franchisee, 15 % of 5000 USD (=750 USD) is deducted from his account. So the money in his account dropped to (1500 – 750=) 750 USD. If CMF did not have any money in his account, he would not have opened an account for the new Franchisee. Let’s suppose the new Franchisee sent two instructors to CMF for training. This means Franchisee paid (2x1000=) 2000 USD to CMF. When the instructors are trained and certified, they must have an online account to practice and train their students. When CMF opens two online accounts for the two new Franchisee instructors, 15 % of 2000 USD (=300 USD) is deducted from his account. So the money in his account dropped to (750 – 300=) 400 USD. When an initial instructor account is opened, online system gives one month free online service for the instructor. For the following months, franchisee must pay 20 USD monthly online fee for each instructor to CMF. If CMF did not have any money in his account, he would not have opened an account for the new Franchisee instructors. Now, franchisee will start her online operations. Let’s suppose, franchisee registered 50 students (25 students for each instructor). This means franchisee received (600USD x 50) 30,000 USD. In order to register and open an online account for students, franchisee must send some money to CMF. Let’s say franchisee sent 2000 USD to CMF. When CMF receives this money, he deposits this amount to Franchise-1 account. Now franchisee has 2000 USD in his account. For each opened online student account, (600 USD x %16) 96 USD is deducted from franchisee’s account. For each student account opened by the franchisee, the online system also deducts half of this value from CMF account. When franchisee-1 opens an account and buys a one year online course for a student, franchisee account drops to (2000-96=) 1904 USD. At the same time, half of this value (96/2) 48 USD is deducted from CMF account automatically by the Anzan online system.CMF account will drop to (400 – 48=) 352 USD. This means, in order to do an operation by the franchisee, he must have money in hisAnzan account. At the same time, CMF must have some money to be deducted from his account. Both CMF and Franchisee have lots of online facilities in the Anzan System. For example, let’s say an instructor is suspected to be cheating and she is using the online system to give private courses at her home. Franchisee may restrict that instructor’s online system to a specific static IP number. This IP number may be the francisee’s office Static IP number. Suppose that franchisee paid three month online service fee for an instructor, but the instructor will give a birth and will be on leave for 3 month time. In this case franchisee is able to pause the instructor’s account for 3 months and restarts it when the instructor returns to her job. If the instructor’s account is paused, the online system pauses also her students in the system. Franchisee can assign the other active instructor to the classroom instead of theinstructor that has been paused.